This past weekend, my sister, my niece and I attended a Crafter’s Retreat at the Badland’s Retreat center. We got there at 2 p.m. on Friday and left on Sunday about the same time. We had a blast scrapbooking, chatting, hiking, eating, and getting very little sleep. When I got home I came down with a monster cold. Yikes, sure hate that. So I haven’t had time to upload any photos from our hike up the butte. However, I did finish a scrapbook page yesterday. I wanted to try something different from what I normally do for this page about my 15th birthday. It is the one I remember the most from growing up. The photo is awful; I only had 2 to choose from, but it has my presents and my first store bought cake. My Mom was great at making and frosting cakes. To this day I prefer an angel food cake for my birthday. I was inspired by this layout. As you can see, I changed it up some, but I truly love to use other people’s layouts to get mine started. So do what do you use for inspiration for your layouts or do you just create a fresh layout every time? 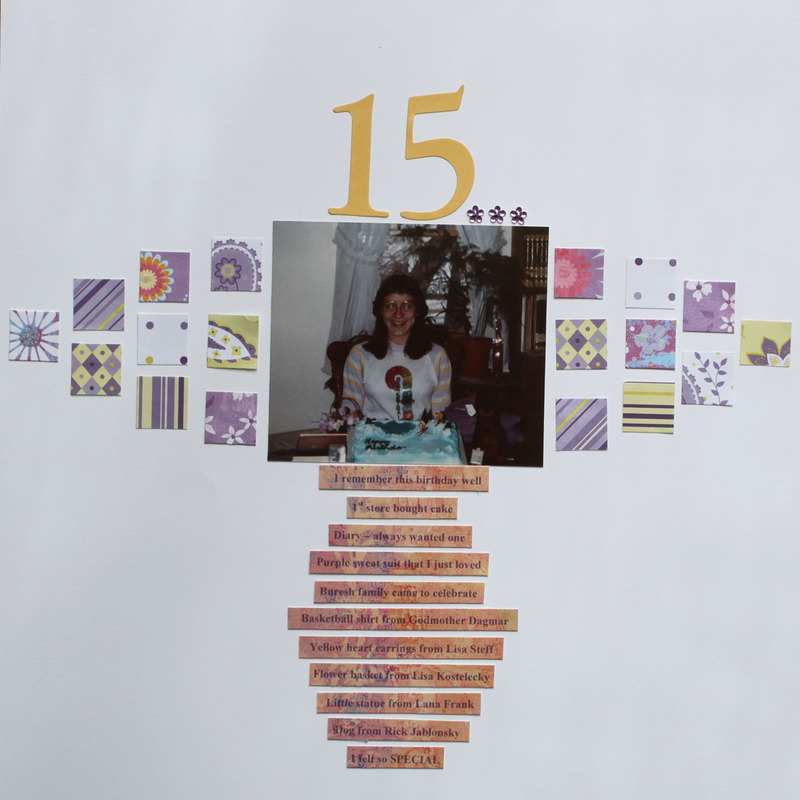 This entry was posted in Childhood Memories, My Layouts by Karen Grosz. Bookmark the permalink. I sure hope you’re feeling better! Wanted to stop by and say “hi!” Enjoyed seeing your scraplift! Mine was inspired by another layout as well. It’s always fun to see how scrapbookers can change up a design. Yes, I am feeling better. Thanks. So fun to hear your layout was inspired by someone else. Just love the inspiration that is out there.